Peg volunteers at El Comedor in Nogales, Sonora. This blog is the story of the people she meets each week. Green Valley News Stop the election lies! Green Valley News Does Nielsen see the True Border Issues? Migrant Walk 2012 "Deep Lessons in Hospitality"
The author is a Samaritan snowbird and was also inspired by this photo and the plight of refugees. She wrote these words to be sung to the tune of Joni Mitchell's "From Both Sides Now." Roberto lives in Ohio but his poem was inspired by a photo that Samaritan Rita Danks sent him. Laurie Jurs and others wrote a song in Tish Hinojosa's Song Writing class at Common Ground on the Border. 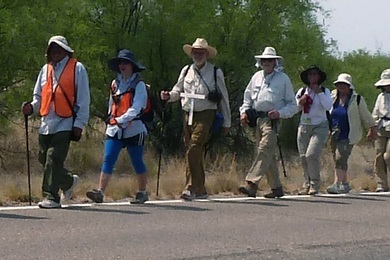 It was inspired by the convictions of the NMD volunteers for leaving water out on the Cabeza Prieta Refuge near Ajo. Honoring 26-year-old Miguel Vasquez Lara, whose body was found in Green Valley on 4/29/11.